I first wanted to apologize for my lack of posts lately. My posts have been few and far in between. I've been doing some traveling, attending a family wedding, enjoying the summer with my 5 1/2 yr old son, etc., but I hope to keep things rolling along at a more regular pace now. It's almost Monday here in NC, so I will go ahead and post my Motivating Mondays blog. When I was thinking about today's post, I asked myself, "What motivates me? What pushes me along? What inspires me to keep going?" My first answer, of course, was music. Big Surprise! :) Another answer that I came up with, was learning new skills that further add to what I already know and practice everyday. I highly recommend it! When you visit this site, you will find a total of 150 FREE beginner guitar lessons plus an assortment of other free videos, written lessons, and chord videos. This site covers chords of all types and rhythm/strumming patterns for guitarists. I really found this site most helpful and the videos moved at an easy pace to follow and play along with the lessons. The instruction techniques are sure to improve any guitarist's playing skills! 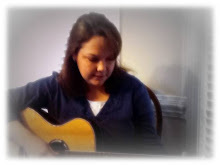 I have a busy week ahead, but I hope to post a couple of songs using some of my new guitar tricks later in the week. Be sure to stop by!